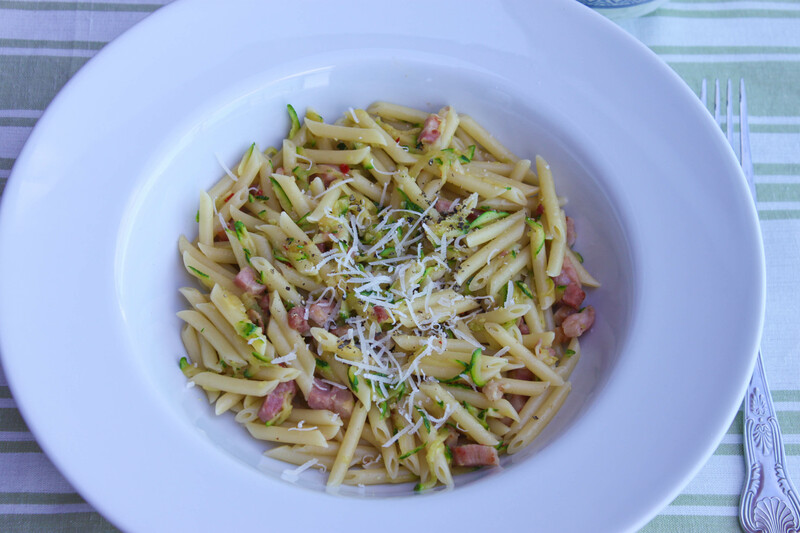 *This recipe is very easily halved so it’s perfect for a quick and yummy supper for one. Start by getting all of your ingredients chopped and ready. Boil your kettle and once boiled, transfer the water to a saucepan. Add a pinch of salt. Heat over a high heat in the hob. When the water is bubbling, add your pasta and cook according to the packet’s instructions. Heat 1 teaspoon of olive oil in a large frying over a medium heat. You don’t want to use too much oil as your bacon will release a good bit of fat once it starts cooking. The ‘sauce’ for this pasta will only take about 6 minutes to make, so start when your pasta is 6 minutes away from being finished. Add the bacon lardons to the frying pan with the hot oil and cook for 3 minutes until starting to brown. Add the chopped garlic and chopped chilli and cook for a further minute, stirring constantly. 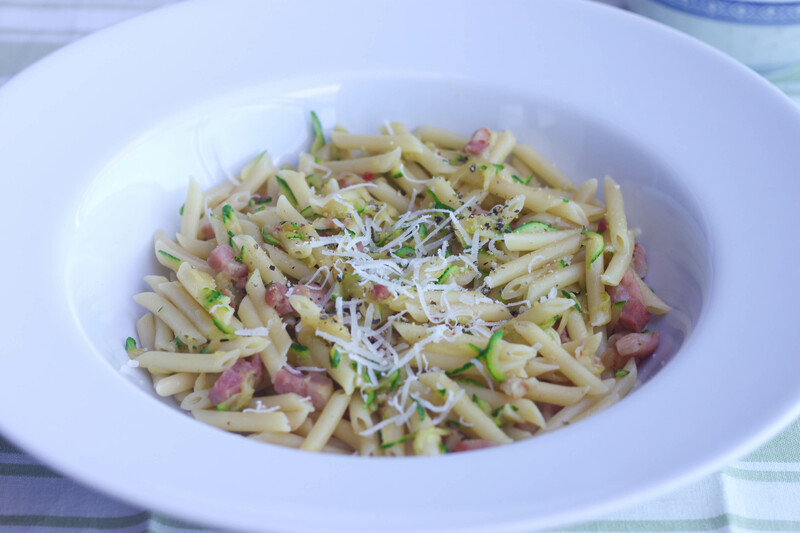 Finally, add the coarsely grated courgette and cook for a further minute, stirring well so that the courgette gets coated in all the lovely bacon, garlic and chilli flavours. Let the courgette cook for one more minute until nice and tender. Meanwhile, your pasta should be done. Drain the pasta and return to the saucepan. Taken off the heat, add the courgette mixture straight into the saucepan and mix well until the pasta is evenly coated. It’s at this point you could add a tablespoon of crème fraiche and put it back over a medium heat to warm it through. Serve with a bit of grated parmesan and a sprinkling of black pepper. The amazing Merill Garbus is the lady behind tUnE-yArDs whose album w h o k i l l is brilliant for a mid-week audio pick-me-up. Or any time of week really. Click on the link for a listen.